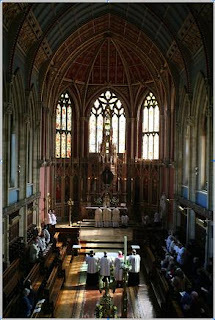 For photographs of previous Douai Retreats go HERE! Please join us to hear about the Faith’s modern-day martyrs at the Church of the English Martyrs, York. Mass will be celebrated by parish priest Fr Dominique Minskip at 12 noon, prior to talks on the persecuted Church. Middle East expert Fr Samer Nassif – himself a Maronite priest from Lebanon – will highlight the challenges that confront Christians in Lebanon and the Holy Land. In a region tormented by conflict and extremist terrorism, Christians are courageously living out their faith against the odds. Hear how – thanks to you – Aid to the Church in Need is promising the hope of Christ’s resurrection to those who carry the Cross in the lands of the Bible today. 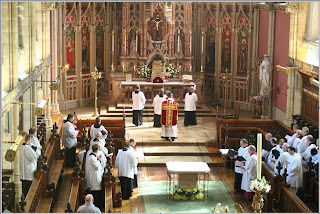 Fr Finigan is the parish priest of of the church of Our Lady of the Holy Rosary at Blackfen in south east London. He is an exceptionally active priest, lecturing part time at St John's Seminary in addition to running a busy parish. He is also very active in the Faith Movement and on Life issues. 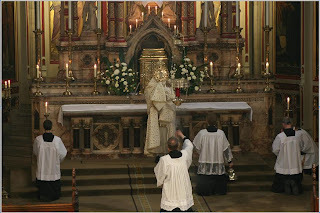 Fr Finigan has provided an extra Mass every Sunday (He says four including the vigil one) and this Mass is in the usus antiquior. It seems that some parishioners (I think about six) are trying to make things difficult for him and have complained to the Archbishop of Southwark. Bishop Lynch, the auxiliary responsible for that area, had a meeting with them and it seems that they were disappointed when he refused to at on their complaint. Their next tactic was to contact the Tablet, whose the deputy editor, Elenor Curti, was dispatched to visit the parish. The result is an article in today's issue attacking Fr Finigan. The article can be read on the Tablet website.. I would recommend that anyone who takes the Tablet should cancel their order. I would also suggest that readers send a letter of complaint to the editor. The e-mail address can also be found on the Tablet website. I know Fr Finigan quite well. He was a tutor at both the training conferences held at Merton College. He also went to the same school as me, although not at the same time. He is probably best known for his blog, the Hermeneutic of Continuity. 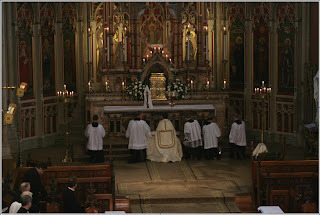 Readers are reminded that Fr Charlton now celebrates a Sunday Mass in the usus antiquior in Middlesbrough. It is at 6.00pm in the Church of St Alphonsus in North Ormesby. The postcode is TS3 6EW for those who don't know the area. 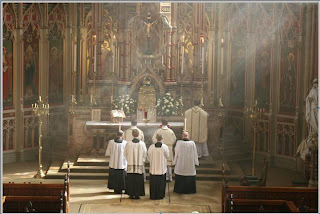 Why not make a special effort to attend this Mass. 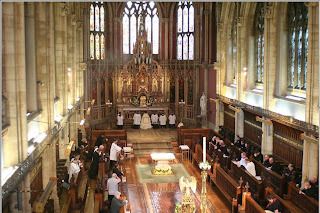 The Latin Mass Society is organising a conference at St Cuthberts College, Ushaw at which priests will receive training in the celebration of the Mass in the usus antiquior. 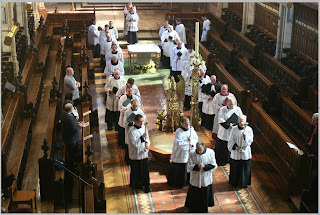 It is open to all priests, but priests of the northern dioceses are particularly welcome. 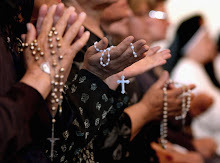 Bookings are coming in steadily, but alas, none have been received so far from priests of the Middlesbrough Diocese. This is a great shame because Bishop Drainey is supportive of moves to improve the provision of traditional rite Masses in the diocese. 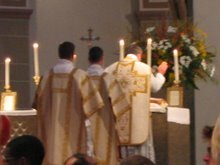 It is a regrettable fact that in this diocese, we are desparately short of priests able to celebrate Mass in the older form. In fact we are at the bottom of the league. Even smaller dioceses like Hallam, Menevia and Wrexham do better than us in this respect. If you know of a priest who you think might be interested, please suggest to him that he attends the conference. They need some encouragement. The conference is from Mon 20th to Thurs 23rd April, and the fee for attending is £85. The magnificent St Cuthbert's Chapel will be used for all the liturgies and the rural setting is just perfect. I must apologise for the length of time since the last newsletter. It has been a busy time and, until now, there has not been a great deal of news to report. 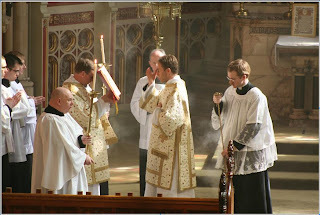 However there are now some significant changes in the provision of old rite Masses in the diocese. Fr Hudson, who had been saying most of the Masses in York, has found it necessary to spend more of his time at the Brussels International School, where he is headmaster. 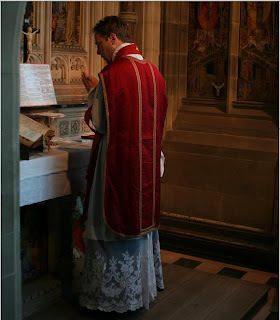 From the beginning of the Autumn term it became necessary for him to be in Brussels on Monday mornings, consequently he could no longer say Sunday evening Masses in York. 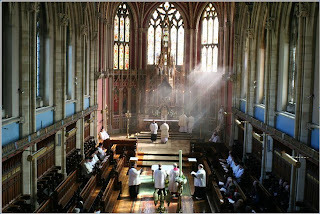 Fr Hudson still says Sunday morning Masses in the Liverpool and Shrewsbury Dioceses. 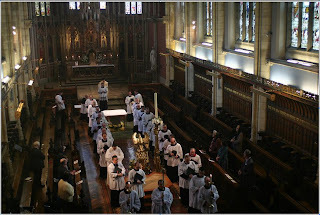 By good fortune, Fr Charlton was able to take over at York and has said most of the Masses in the latter part of 2008. He had been expecting a new appointment for many months, and in mid January moved to the Church of St Alphonsus in Middlesbrough. There, he will celebrate a weekly Mass in the usus antiquior every Sunday at 6pm. This is a great gain for Middlesbrough and I hope that it will be well supported by members living in that part of the diocese. The departure of Frs Hudson and Charlton from York has left us with some difficulty. 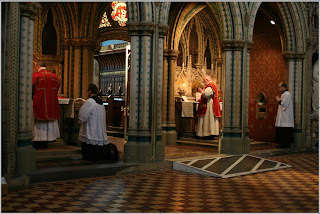 When I met Bishop Drainey a year ago, he did undertake to seek out diocesan priests who would be willing to learn to celebrate Mass in the older form. 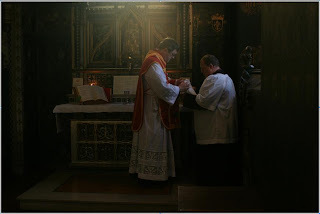 This has borne fruit in the person of Fr Stephen Maughan who is currently being trained. 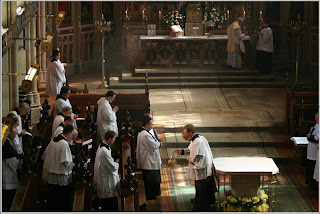 He moved from Hull to York in January, and when he has completed his training, will offer Mass in the older rite at York. I am not sure when this arrangement will begin, but will send out another newsletter with details when we have a starting date. Bishop Drainey is aware that there will be occasions, for example holiday times, when Fr Charlton will not be able to say the Sunday Mass in Middlesbrough. To cover these circumstances, he has asked Mgr Heslin to provide cover, which he is very willing to do. 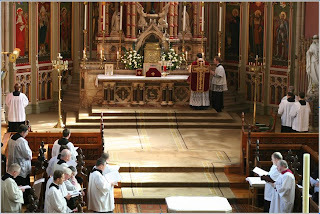 However, a consequence of this is that the First Friday Masses at St Clare’s in Middlesbrough will be discontinued. I know that this will be a disappointment to those who have been supporting that Mass, but with limited resources, we can only do so much. 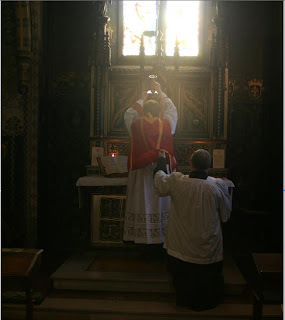 The regular 9.00am Sunday Low Mass celebrated by Fr Elkin at Barnard Castle in the Hexham and Newcastle Diocese continues. 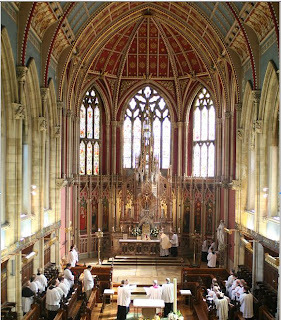 Also, a regular Mass has been introduced by the Leeds Diocese each Sunday at 3pm in the Church of St Joseph in Castleford. This is celebrated by a variety of priests. 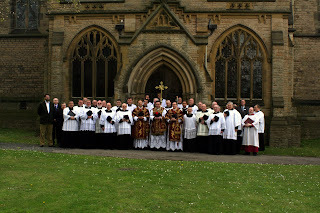 In the Nottingham Diocese, there is a regular Mass every Sunday at Holy Souls Church in Scunthorpe. 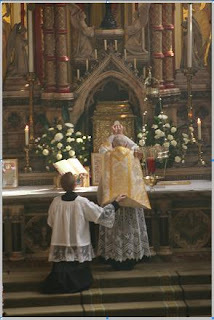 It is generally a sung Mass on the third Sunday of the month. See the supplement to Mass of Ages for other times and locations. 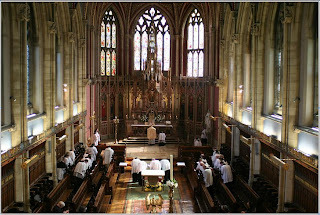 The Latin Mass Society is organising a residential conference at Ushaw College for priests wishing to learn to say Mass in the usus antiquior. It will take place in Low Week from Monday 20th to Thurs 23rd April and tuition will be provided by priests experienced in the older rite. At the time of writing, no priests from the Middlesbrough Diocese have signed up for this conference, although there is considerable interest among clergy from other northern dioceses. 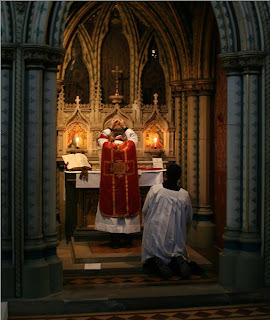 It would be a shame if no Middlesbrough priests took advantage of this opportunity, as there is no prospect of getting further old rite Masses until we have more priests trained in the rubrics. If any members know of priests who might be interested in attending, please give them some encouragement to attend. Application forms can be downloaded from the LMS website. 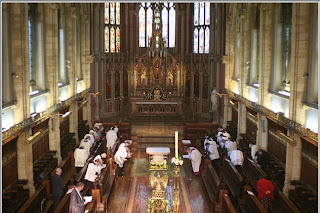 It will be run along the lines of the very successful conferences held at Merton College, Oxford in the last two years. 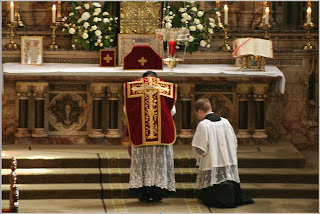 Every Sunday Low Mass 6.00pm Church of St Alphonsus, North Ormesby.